Product #3106 | SKU 1SKB-R904U20 | 0.0 (no ratings yet) Thanks for your rating! The SKB R904U20 4U Roto Shock Rack features a 50.8 cm deep rack frame installed in a roto moulded tough shell with an integrally moulded valance that eliminates the metal valance on the outside of the case, coupled with a rubber gasket on both the front and rear doors for water resistant protection. The integrated moulded valance, ergonomic handles, and recessed, heavy-duty twist latches allow these cases to meet most ATA and military specifications. An internal frame mounted on adjustable Elastomer shock absorbers on all eight corners. These shocks are designed to control the effects of shock and vibration on three axes. The "sway" space around the internal frame provides natural air conditioning. This is very important for delicate audio equipment. This case is half the weight of traditional wooden cases. 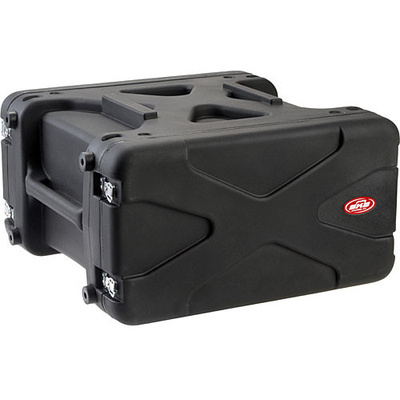 This SKB-R904U20 Roto Shock Rack case has the Roto X pattern and is stackable within the series.